As the world learned news that former First Lady Nancy Reagan died in her home at age 94, it was with great honor and respect that it looked back on her compelling (and occasionally controversial) legacy. Indeed, the First Lady became a political and social icon in her own right, and Nancy Reagan's best advice, given to both her husband Ronald Reagan, politicians, White House staff, and the American people at large, continues to resonate today. 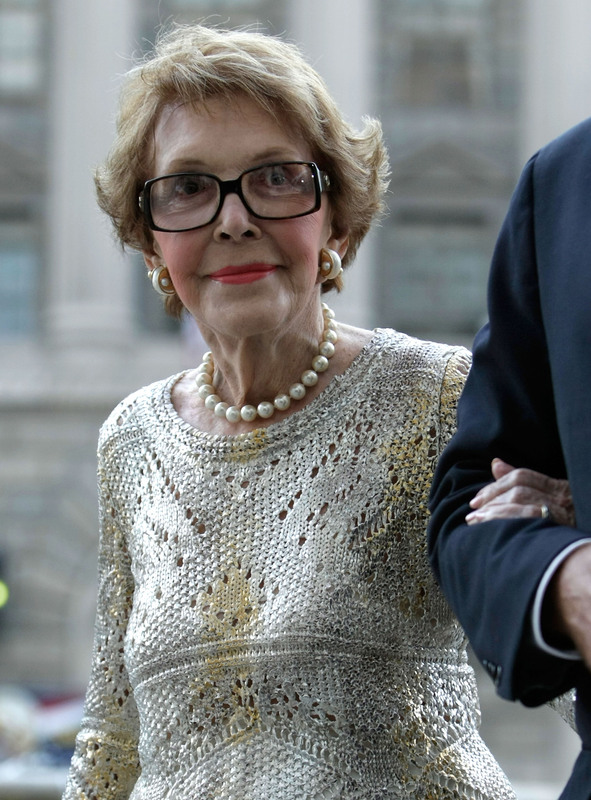 The First Lady, who The New York Times credits as being a "fierce guardian of her husband’s image" throughout their time together in the White House and otherwise, was celebrated for her leadership roles she maintained throughout the 80s and 90s, helping to shape the course of both international and domestic affairs. Among her many notable successes, Reagan launched the "Just Say No" campaign in 1986, an initiative aimed at ending drug abuse in America. She also worked hard to raise breast cancer awareness after being diagnosed with the disease herself in the late 1980s, as well as advocated for embryonic stem cell research following President Ronald Reagan's battle with Alzheimer's Disease. Behind the scenes, Nancy Reagan was also credited with being her husband's rock during his time in office. It was through her advice that the President publicly apologized for his involvement with the Iran-contra scandal, and according to The Washington Post, she was "intimately involved in staffing and political decisions." But, you don't have to be familiar with the inner workings of the Oval Office to feel the impact of Nancy Reagan. Here are three of her greatest pieces of advice that are still relevant today. "There's a big, wonderful world out there for you. It belongs to you. It's exciting and stimulating and rewarding. Don't cheat yourselves out of this promise." One of Nancy Reagan's most memorable quotes, this inspiring bit of wisdom was given during a speech she made with her husband to the nation ahead of the National Crusade for a Drug Free America bill in 1986. During the address, which took place in the West Wing of the White House, the First Lady urged Americans to "just say no to drugs," citing the many opportunities that exist for people willing to look for them. It's a message that is still relevant today, no matter what the context. "Feminism is the ability to choose what you want to do." Reagan uttered these words during a 1985 interview with McCall's magazine, where she defended her choice to quit her own acting career to help her husband with his political career. With just a single sentence, Reagan was able to express that equality is being able to decide your fate for yourself, and to follow your own heart rather than listen to what others tell you to do. Ultimately, Reagan said, she chose to have a career, and then she chose to focus on her husband's instead. Nobody forced her to do anything. It's a welcome reminder that feminism can mean many things — but it boils down simply to equality. "You learn something out of everything, and you come to realize more than ever that we're all here for a certain space of time, and, and then it's going to be over, and you better make this count." This poignant quote came up during an interview with Diane Sawyer. Reagan described her final days with Ronald Reagan, who she loved dearly until the end. The First Lady remarked that what she and her husband had together had been beautiful, and that while nothing can last forever, that doesn't mean what we do in life can't be meaningful. It is an especially fitting quote to remember Reagan by as the world continues to feel the impact left by her legacy. During her 94 years, she certainly made her moments count.